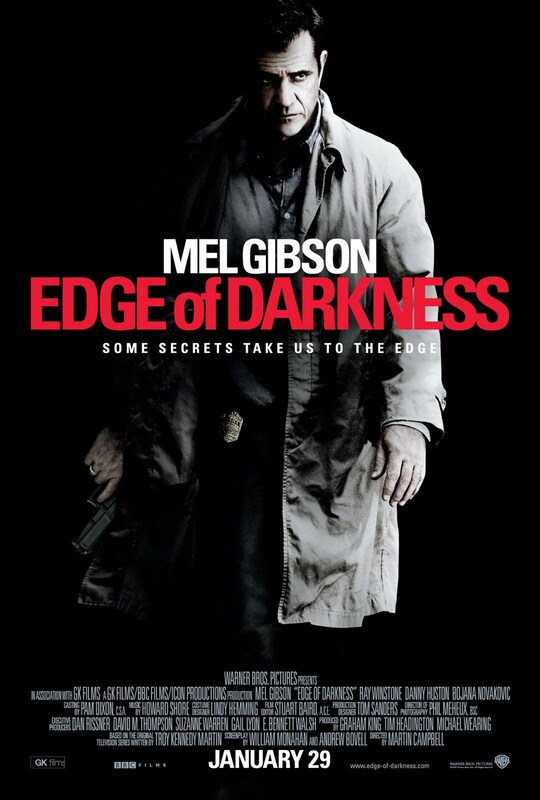 If Martin Campbell's Edge of Darkness were released in the 1970s or even the early 1980s, it would have been accepted as a thriller. But, by today's standards, it qualifies a drama with occasional bursts of violence. Foolishly mis-marketed as a riff on Taken, this film is not a thrill-a-minute action picture but rather a slow and sobering story about crippling grief. Based on a 1985 BBC miniseries (also directed by Campbell and pretty terrific in its own specific way), this project was tailored made for Mel Gibson and he does the material proud. In a season where some of our best talents (Tim Burton, Martin Scorsese, Roman Polanski) have crashed and burned with critical disappointments, Martin Campbell delivered a genuinely compelling B-movie that emphasized character and story over visceral thrills. A token amount of plot: The film basically concerns Boston cop Thomas Craven (Mel Gibson), who sets out to investigate why his adult daughter (Bojana Novakovic) was shotgunned to death on his doorstep in front of his eyes. While the initial working theory is that the murder represents payback for something Craven did in the line of duty, the emotionally-crippled detective soon realizes that his daughter may have been the target all along. Craven receives some unexpected assistance from Darius Jedburgh (Ray Winstone), a mysterious 'fix-it' man who is apparently having second thoughts about doing bosses' dirty work. Needless to say, the trail eventually leads to a shadowy corporation and its high-level misdeeds. Will Craven uncover just why his daughter was murdered, and what will it cost him in the process? The film may not reinvent the wheel, but it is a deliberate and pleasing throwback that takes its plot seriously and allows everyone to act like adults at all times. The intermittent violence packs a wallop because it is taken very seriously and viewed in terms of human loss (even the bad guys complain about collateral damage). At the center of the somewhat run-of-the-mill conspiracy plot are two fantastic performances. Returning to onscreen acting after an eight-year absence, Mel Gibson obviously dominates the proceedings as low-key Boston cop Thomas Craven. The usually flashy Gibson internalizes Craven's mourning, letting you see his despair in his eyes rather than through overt monologue. Furthermore, Gibson remains one of the few male actors who can convincingly play a loving parent without laying on the schmaltz. Winstone has the slightly showier role (no one chews scenery here) as a seemingly decent man who has never really given enough thought to the indecent things he has done in his career. Veteran character actor Jay O. Sanders again plays a cop, but even he is given a heartbreaking moment where he must choose between helping his partner and protecting his family. And while Danny Huston threatens to become mustache-twirlingly devious as one of the heads of 'not-Haliburton', the invaluable Denis O'Hare grounds the backroom treachery and brings a welcome humanity to the 'bad guys'. Martin Campbell again proves that he makes pictures for adults with adult sensibilities. The film is refreshingly R-rated, both for the occasional bits of blood-stained violence and for the fact that it is a genuine adult thriller. The action finale feels tacked-on, and there are signs of behind-the-scenes tinkering with just a few moments of gratuitous 'action', but the film works as an engaging and emotionally-compelling drama. In an age where every big-studio picture is either a tentpole fantasy epic or a low-budget Oscar bait project, Edge of Darkness is a refreshingly old-fashioned star-driven genre picture. In the end, it's just a damn good movie.